Today we feature two projects, both created by the amazing Sharon Morrison! 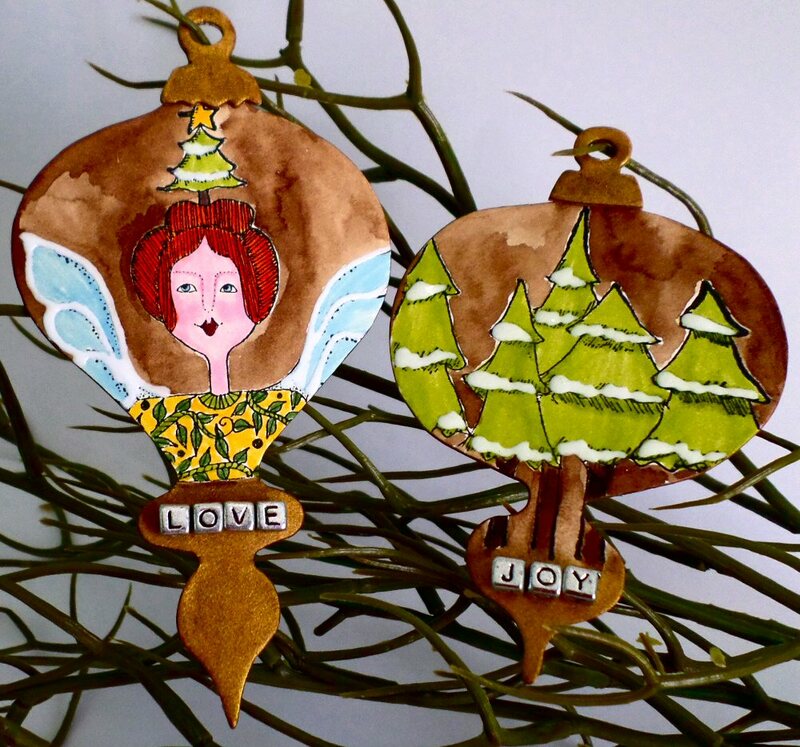 Not only is Sharon one of IMAGINE Crafts’ Artists In Residence, but she also is on the RubberMoon Design Team. 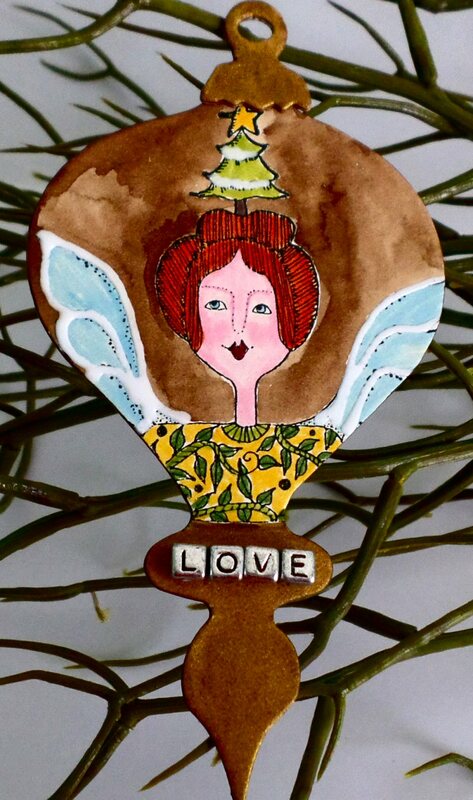 We hope you enjoy her festive ornaments and colorful clock she created for today’s blog post. It has become a personal tradition for me to make ornaments each year. This year I am proud to be using the beautiful images of RubberMoon. 1. 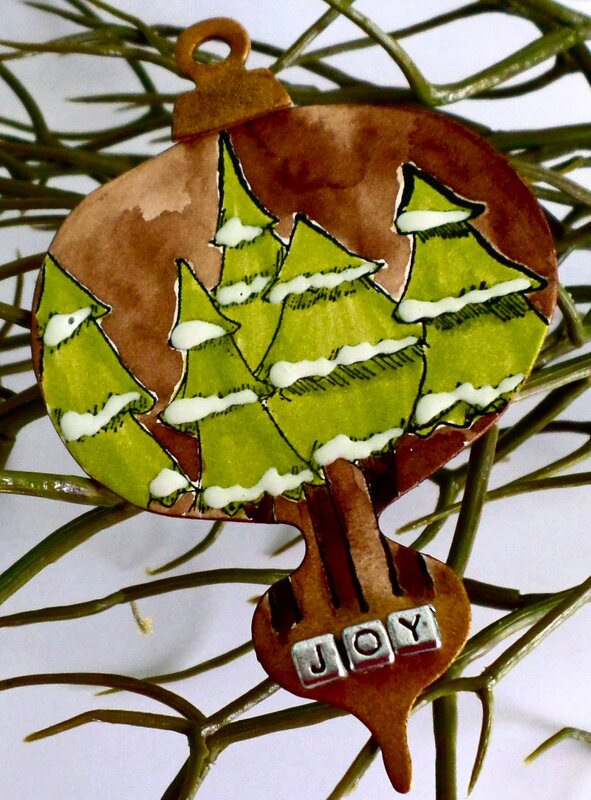 Die-cut your ornaments from mount board. Chip board can also be used as a substitution. 2. Stamp the images onto the die-cuts using VersaFine Onyx Black. 3: Paint around the images using Walnut Ink (mixed from Walnut Ink Crystals) and allow to dry. 4. Color the images using Memento Markers. 5. Assemble with glue and pipe irRESISTible Pico Embellisher in Wedding Dress around the angel wings and on the trees as shown. 6. Add other embellishments as desired. I wanted this project to be relevant in my workspace as all to often I get carried away with color and end up making mud! This clock will be a constant reminder of the color wheel and the colors that go together and those that don’t! The dial is the pure color and tint. A tint is pure color mixed with white. The numeral ring is done in grey, because grey mixed with a color creates a tone. The base is black, because black mixed with color creates a shade. Imagine Crafts/Tsukineko: Memento Luxe: Morocco, Olive Green, Pear tart, Dandelion, Danube Blue, Love Letter, Lilac Posies, Sweet Plum; Memento Marker in London Fog. Miscellaneous: black and white acrylic paint, ruler, pencil, glue. 1. Paint all parts with white acrylic paint and allow to dry. 2. Using a ruler and a pencil, divide the dial into 8 sections (or more if you want to). 3. Using a watercolor brush, paint each sections using the Memento Luxe inks and allow to dry. 4. Color the dial (the piece with the numbers on it) with a Memento Marker in London Fog. 5. Paint the base black. 6. When dry, assemble your clock. This entry was posted in Home Decor, Mixed Media, Sharon Morrison. Bookmark the permalink. We are so privileged to have such a wonderful designer as part of our team(s). LOVE both projects SO much! Thank you! 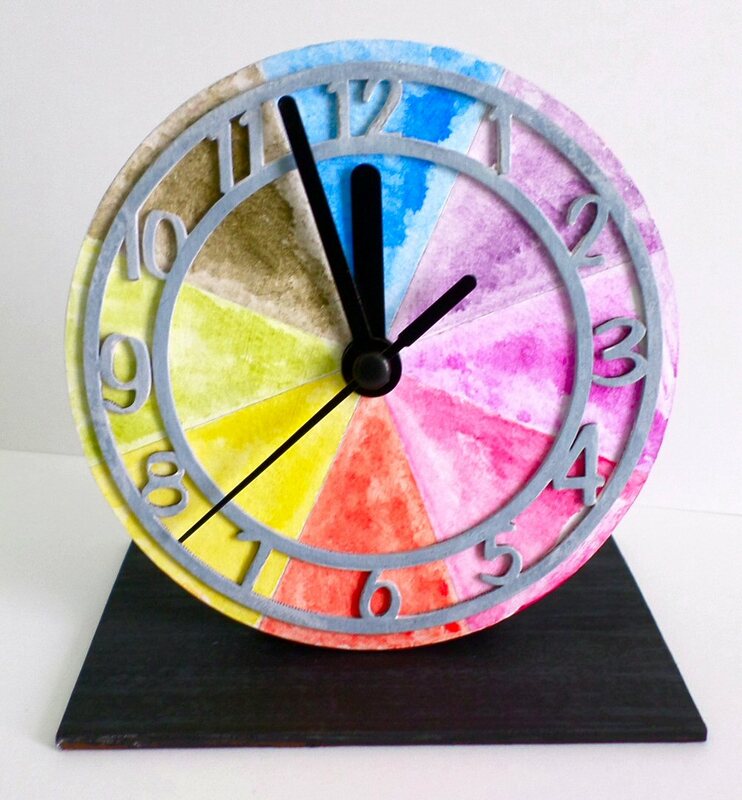 LOVELOVELOVE the color wheel clock! Such a unique idea that I am going to have to craft steal!! Thanks for the inspiration!